« Kids know: recumbents are cool! 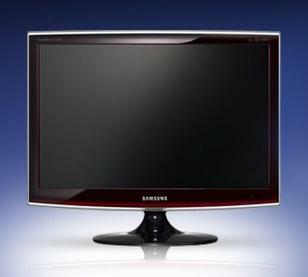 The Samsung SyncMaster T240 is a 24″ 1080p LCD. I just picked one up at my local computer dealer PCCyber for a pretty decent price of $300 CA, lower than I’ve seen at the big box stores and a pretty amazing price for a 24″ 1080p LCD (for comparison, shopbot.ca is showing prices ranging from $299 TO $462). For about two years I’ve been using the Samsung SyncMaster 225BW. At 1680×1050 and 5ms response, I bought it primarily as a gaming monitor. For this it was fine, although in truth I was never happy with the color fidelity and text was ok but not fantastic. By contrast, my previous monitor, a ViewSonic VP201s had great color and text, but being an earlier panel technology, showed motion blur in gaming. Perhaps that’s an unfair comparison since that Samsung was a consumer level monitor while the ViewSonic was a professional level one. Since I don’t just use my computer for gaming, I’ve never been happy with this trade off. The T240 provides better color fidelity and text than my previous Samsung, is fast enough for gaming, and at 1920×1200, has tons of real estate. Just tonight I was watching an episode of 24 while reading an investment outlook report (ugh, but that’s a different discussion). And I must say that playing Company of Heroes at 1920×1200 on a 24″ monitor is spectacular. To try to compare apples and apples, I will contrast it with the Lenovo L220X I use at work. The Lenovo is 2″ smaller, but more importantly, I’ve not been impressed with it’s color fidelity or text rendition. Albeit I’m comparing with two different graphic cards too, but what I noticed with the Lenovo is that, being a high gamut panel, it seemed to miss the mark in color balance. Even if you’re not doing color sensitive graphics work, color balance is still important for text readability if you use TrueType text on WindowsXP or Vista (which you likely do since it’s on by default) because TrueType dithers the text with antialiased pixels of blended color. If those colors aren’t right, the text can look blurred or odd, reducing readability. It took a lot of research and several rounds of adjustments to get the color settings to a point on the Lenovo where text was acceptable for day to day work. The Samsung on the other hand had immediately readable text. And at a suggested retail of $499 CA for the Lenovo, the Samsung is a great deal giving you better text, better color, a larger screen, for less. The Samsung T240 isn’t the clearest text I’ve seen (my old ViewSonic still wins for this), but is the clearest I’ve seen so far in a monitor of this size and resolution. One fault I’ve noticed with the text is that you get some artifacting if you look at the text off-axis. This isn’t just about being at an odd angle to the monitor, but occurs during normal usage because at 24″ you’re going to be off-axis to the edges. Specifically, I’ve noticed that text at the top of the screen appears slightly bolded, and text at the bottom slightly thin. The T240 is a nice looking monitor. Traditionally, desktop monitors have been nothing more than a panel with some black or gray injection molded framing and a few controls. The Samsung is a more sophisticated looking piece of consumer electronics, likely taking some design influence from trends in large format living room LCDs and Plasmas. You could thus consider it’s use in places other than the desktop, such as in a living room or bedroom. Although it has a nice looking base that complements the overall styling, you cannot raise or lower the panel. Also, I’ve not been able to tilt it, although the specs claim you can. This lack of adjustability was disappointing to the point where I considered returning it. The base does swivel, although I’ve always found this to be the least useful adjustment. In conclusion, I’m happy with the T240. Not ecstatic, but happy. Great as a gaming monitor, good as a work monitor. For $300 I have better color, text, resolution, and size than I had before, and I don’t see anything in that price range that can compete. My impression is that Samsung gives you good value for money in a 24″ 1080p monitor. This entry was posted Saturday, January 3rd, 2009 at 6:31 pm	and is filed under Technology. Both comments and pings are currently closed. Hi, just a quick note to say yes it does tilt, but due to a manufactoring issue its not easy to make it do so. I’ve had to return mine cos it really wont tilt, but as a rule they are meant to. What a great monitor it is though! Thanks Alex, that’s good to know! Glad you’re happy with your monitor.